The Blockchain Technology is already decentralized. It has disrupted multiple sectors such as Health, Tourism and even E-Governance. For a group of individuals to come together and think, not just outside the box, but to also change the box into a different object all together, makes one sit up and pay attention. 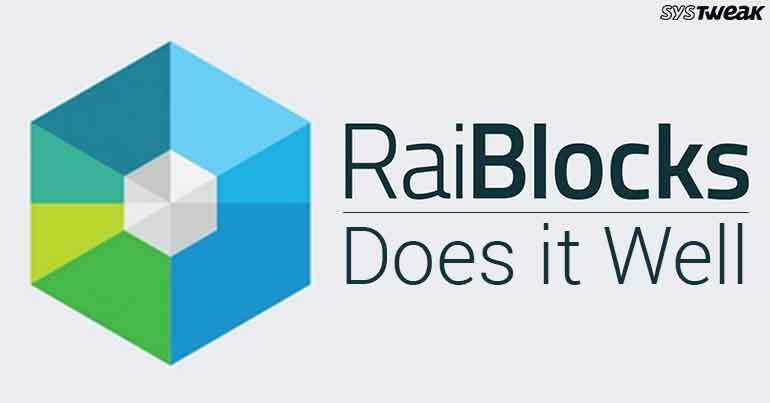 RaiBlocks, has a motto. ‘Do one thing, do it well’. With this intent in mind, the group of professionals behind it, have created an entire Block lattice of different Blockchain for every account. Keeping Bitcoin in its crosshair, RaiBlock aims to cover the discrepancies which Bitcoin suffers from ie. efficient, viable alternative to fiat currencies. Bitcoin, Ethereum etc. are some of the cryptocurrencies that initially took a limited sum as transaction fees. With RaiBlocks, zero fees is demanded simply because the protocol on which it operates is incredibly lightweight and nodes that are running technically cost them pittence. RaiBlock offers its account holders wallet with the ability to pre-cache the anti-spam Proof of Work that is required for the next transaction, at the exact time when a transaction is sent. This makes transactions instantaneous, as both sides have the proof of work ready. The intention behind this process is to prevent transaction spam and increase the speed. Must Read: Tron: The New Super Cryptocurrency! More exchanges are currently under negotiations to trade RaiBlock. The desktop wallet can be downloaded from the RaiBlocks website. RaiBlock is not just another cryptocurrency. It has the potential to rise above the titans of the cryptocurrency world and make a space for itself. Keep your eyes open for this one folks.